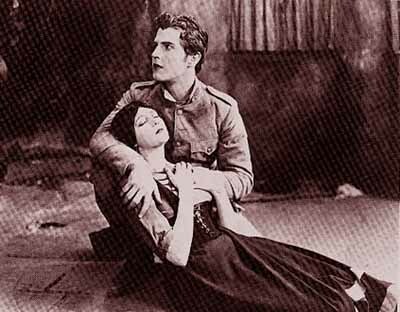 Barbara La Marr dies in the arms of star-in-the-making Ramon Novarro in Fred Niblo's 1924 melodrama Thy Name Is Woman. “And she was hardly exaggerating: By age 19 she had been married three times, divorced and widowed. In her 20s, she married twice more. Still, she found time to become a world-famous actress, only to die at 29 a few months after collapsing on a movie set. “Despite the fact that the Jazz Age screen goddess died in Altadena more than 80 years ago, she will 'return' as 'hostess' of a cemetery tour there in November. Rasmussen's article is well worth a read, even if bits of information in it seem questionable. Did Mussolini really play himself in George Fitzmaurice's now lost The Eternal City, or did the film merely use what amounts to documentary footage of the Italian dictator? Also, I don't know about Barbara La Marr dancing with Ramon Novarro, though they did appear together in three films: Rex Ingram's 1922 version of The Prisoner of Zenda and his 1922 dark melodrama Trifling Women (a lost film that in several ways – characters, visuals, chimp – reminds me of Sunset Blvd. ), and Fred Niblo's 1924 melo Thy Name Is Woman. And finally, perhaps La Marr did compare her lovers to her roses, but in those days studio publicists came up with all sorts of quotes and stories to match their stars' screen personas. Since La Marr usually played vamps on screen, she was supposed to sound and behave like one off-screen as well. Barbara La Marr, known as The Girl Who Is Too Beautiful, was MGM mogul Louis B. Mayer's inspiration when he renamed Hedy Kiesler as Hedy Lamarr. I didn't know Paul Bern had children. Can you please elaborate? Author Allan Ellenberger was good friends with Jimmy Bangley. I stumbled upon this…if you're talking about Jimmy Bangley, I'm very sorry to hear it. I was a librarian at AFI in the early 90s and researched La Marr, hoping to write a biography myself, but there was SO much contradictory information. I also began to think it would be more fun to write a novel about the whole period, and I still plan to. I corresponded with Mr. Bangley and gave him all my notes. Ideas of beauty have definitely changed in the last 80 years. Not that I'm aware of. I know someone who was working on one, but he died a few years ago. Are there any Barbara La Marr biographies out there?